This is a Liar Fillomino puzzle. In addition to the usual rules, exactly one given number in each row and column is false. Part 4 of 4 in my half of the preview series for Fillomino-Fillia 2. See mathgrant’s blog for the other half. Answer Entry: Enter the units digits (last digit) of the number in each circled cell starting with the leftmost column and going right. The test will be available to play on LMI pretty soon. Please give it a go this weekend if you can find the time, and good luck if you do! This is a Nonconsecutive Fillomino puzzle. In addition to the usual rules, two orthogonally adjacent cells may not contain consecutive numbers. Part 3 of 4 in my half of the preview series for Fillomino-Fillia 2. See mathgrant’s blog for the other half. This is a No-rectangles Fillomino puzzle. 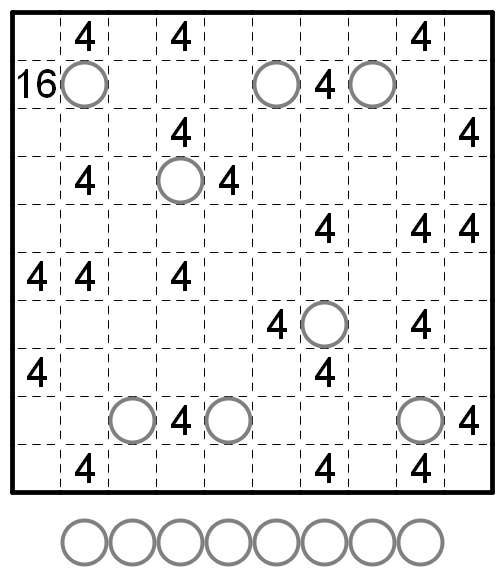 In addition to the usual rules, none of the polyominoes can form a rectangle. Part 2 of 4 in my half of the preview series for Fillomino-Fillia 2. See mathgrant’s blog for the other half. This is a Fillomino Snake puzzle. 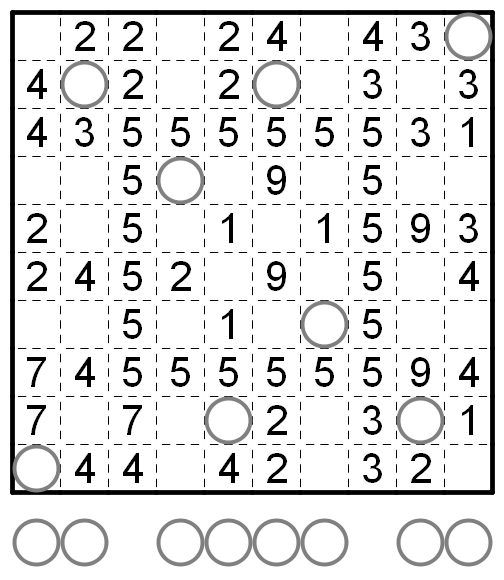 A snake with a head and tail and unknown length must be drawn in the grid so that it contains all shaded cells. The snake does not touch itself, even at a point. 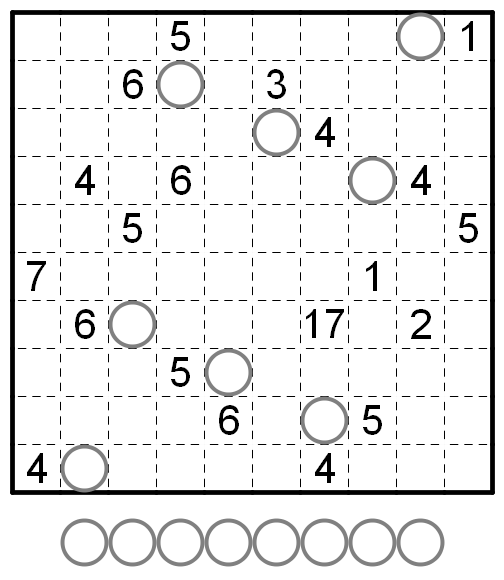 The remaining spaces must be divided into polyominoes satisfying the usual Fillomino rules. 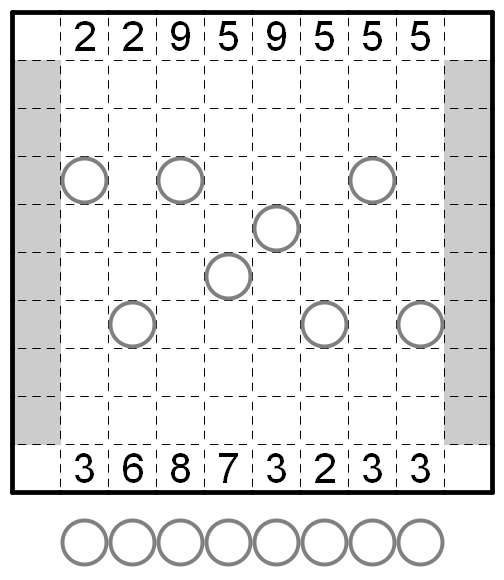 The snake may touch polyominoes of the same size as itself. Part 1 of 4 in my half of the preview series for Fillomino-Fillia 2. See mathgrant’s blog for the other half. Answer Entry: Enter the units digits (last digit) of the number in each circled cell starting with the leftmost column and going right. For a cell with a snake segment, write X. On a related note, it seems the WordPress thumbnail issue has fixed itself. That’s a relief.